Food is usually one of my favorite parts of a walking tour. On the Final Stage of the Camino Frances, I got more than I bargained for with culinary treats that still have my mouth watering. Scrap those packed lunches and get those taste buds ready for some delicious Galician cuisine! Pilgrims enjoying a short break for lunch at one of the many albergues (hostels) along the Camino Frances. Once you’re ready for lunch, you’ll typically find some sort of bocadillo or salad. Bocadillos are traditional Spanish sandwiches, typically made with a baguette and local meats and cheeses. I even tried some with eggs, which were a tasty addition. Lunch on the Camino Frances will provide you with all the energy you need to keep moving. 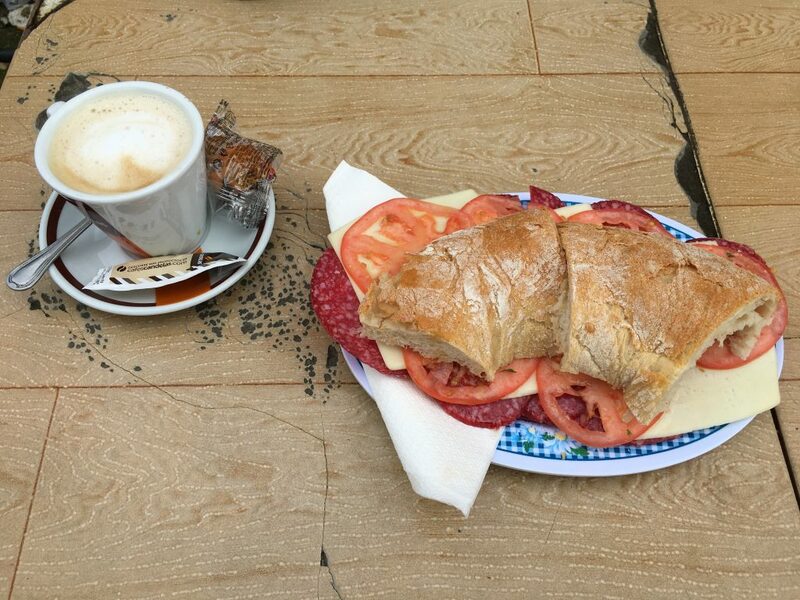 A bocadillo and a cup of coffee always help keep you going. 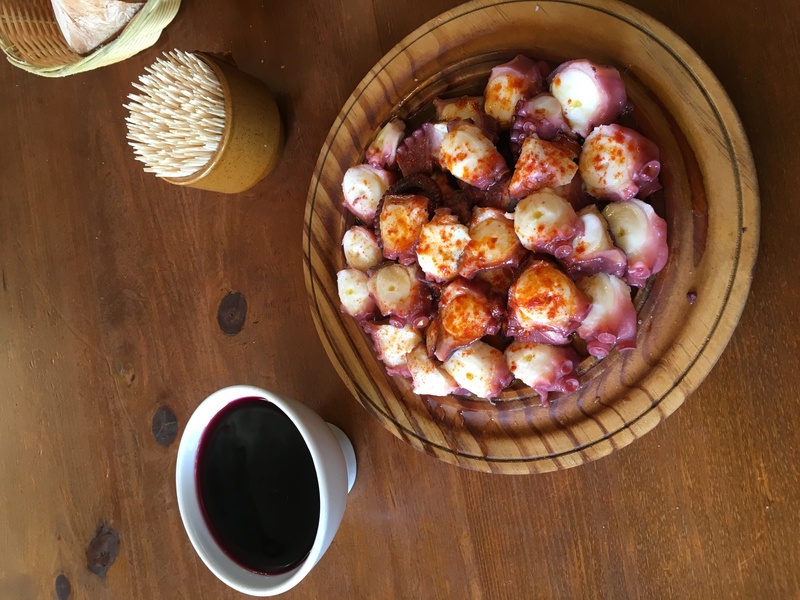 Let’s talk about my favorite Galician dish: octopus. This is one of the most traditional dishes in Galicia and it’s absolutely amazing, whether its boiled or grilled. Once you get over the fact that you’re eating tentacles and suction cups, you might eat it for almost every meal (like I did). 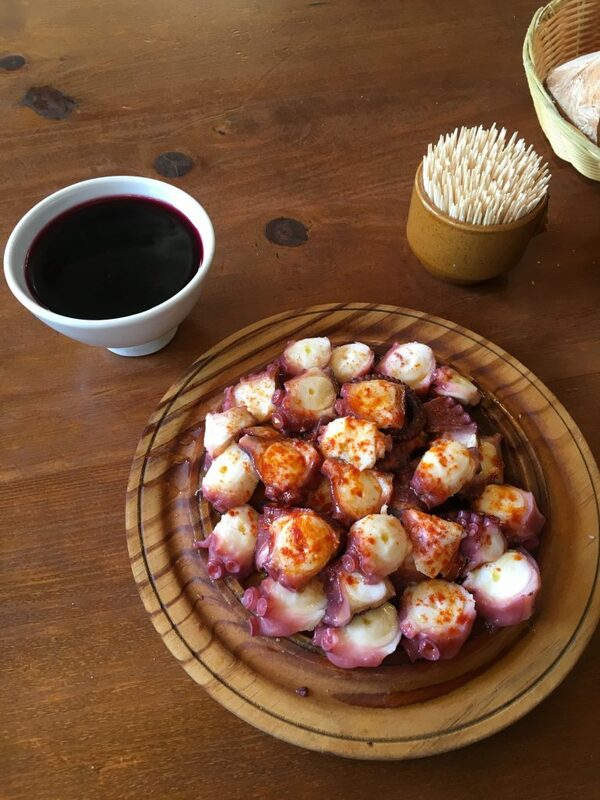 Bites of seasoned octopus and a cup of red wine – my favorite! 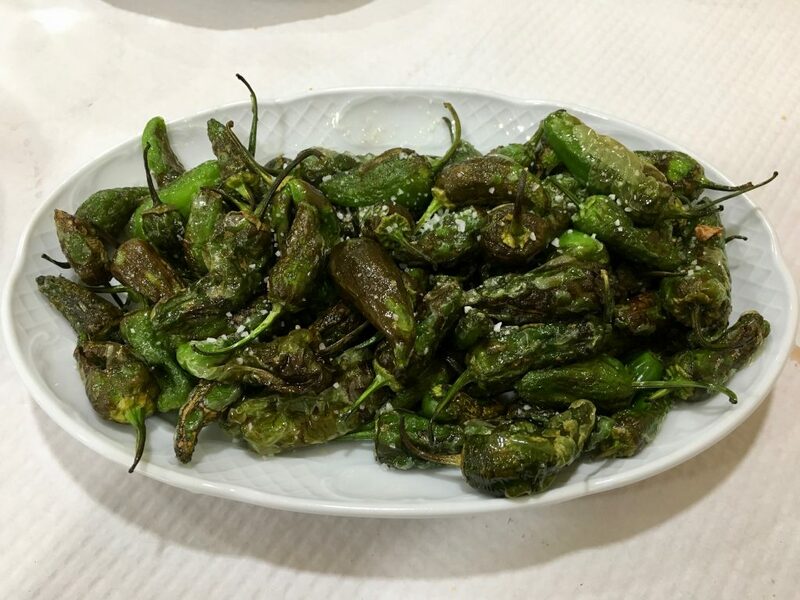 Another excellent local dish I highly recommend trying is pimientos de Padrón, or Padron Peppers. Only about one in ten of the small green peppers are hot, while the rest are mild. I didn’t learn this until a few days after I tried the dish and had one very tiny pepper take me by surprise. During one of my dinners with the locals, it was fun to hear how each of them chooses their peppers off the dish in order to avoid the hot ones. The truth is that it’s almost impossible to tell them apart until it’s too late. Traditional pimientos de Padron are a tasty regional dish, but watch out – a few may be spicy! You might be thinking that this food looks expensive for a vacation budget, but it’s generally quite reasonable! The Pilgrim’s Menu option, like the one from Meson a Forxa in Palas de Rei, only cost €9.50. A Pilgrim’s Menu usually consists of bread, a bottle of wine, an appetizer, a main entrée and a dessert. Set menus can sometimes be disappointing, but I’m a strong advocate of the Pilgrim’s Menu because there are always great course options. These menus even encouraged me to break away from octopus and try things that I didn’t know exist, like pork knuckle (which I highly recommend). Traditional Pilgrim’s Menu meal of octopus and potatoes served at Meson a Forxa in Palas del Rei. 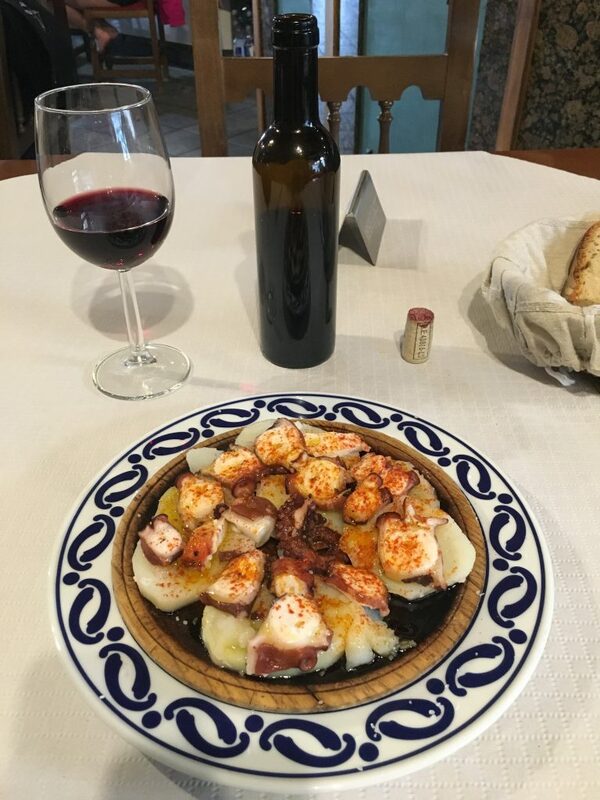 Meals along the Camino Frances are reason alone to complete the pilgrimage and – along with the four dishes I mentioned above – you’re sure to find a taste that suits your every need. Once you have walked the final 70 miles of the Camino Frances, you should treat yourself to one final traditional Galician meal at O Dezaseis, in Santiago de Compostela. After all, you’ve earned it! 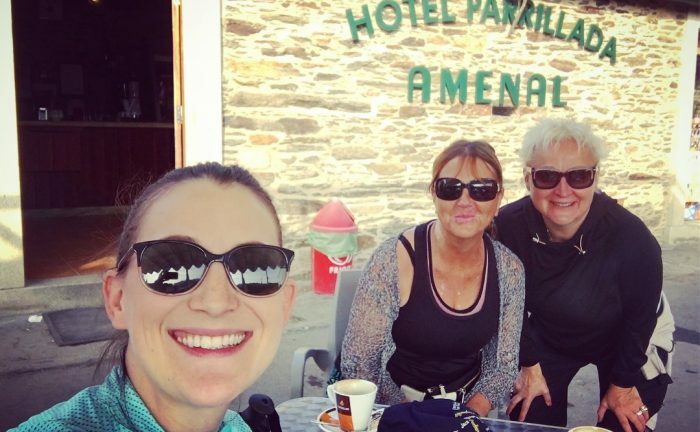 Take a look through our Camino blog posts for news, tips, FAQs and trip inspiration for all things Camino. 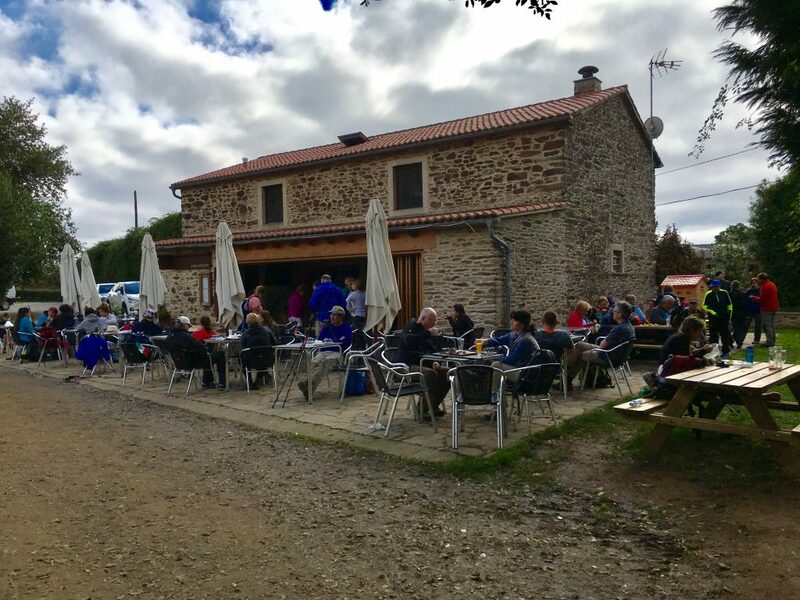 To check out the itinerary featured in my post, take a look at our Camino Frances Final Stage trip, or contact one of our specialists, who will be happy to help you personalize a Camino adventure of your own. I'm a self-proclaimed adventure zealot. After traveling solo around South America, New Zealand and Europe for the better part of a year, I absolutely fell in love with adventure travel, the people you meet and the cultures you experience. 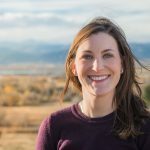 A born Michigander, you'll often find me relaxing at a lake, or spending some quality time with my two dogs, Cooper and Sydney.